The Iditarod is known for pushing sled dogs and mushers to their limits, and that is precisely what happened to competitor Scott Janssen and his Siberian Husky, Marshall. Scott Janssen saved his dog’s life by giving the collapsed pooch mouth-to-mouth. On Monday night, while traversing the Dalzell Gorge, Marshall suddenly collapsed on the line. Janssen stopped the sled and ran over to his dog. To his horror, Janssen discovered that Marshall wasn’t breathing. “Boom! Laid right down. It was like a guy my age having a heart attack,” Janssen described. Janssen, known as “The Mushing Mortician” because of his day job as the owner of an Anchorage funeral home, immediately knew that the outlook wasn’t good. “I know what death looks like, and he was gone,” Janssen said of the unconscious Marshall. The sled team’s location at the time of Marshall’s collapse was remote; they were 22 miles out from their next checkpoint at Rainy Pass. Knowing that he was Marshall’s only chance, Janssen tried the only thing he could think of: CPR. Janssen put his mouth over Marshall’s muzzle and blew, trying to get his dog to breathe. After two rounds of mouth-to-mouth and chest compressions, Marshall began to show signs of life. Though Marshall was starting to come to, his condition was still grim. Janssen scooped the dog up into his sled and raced towards the Rainy Pass checkpoint, where the Iditarod veterinarians could better treat the ailing Husky. At this point, it seems that heart arrhythmia is the likeliest culprit. “The vets took a look, gave Marshall an IV, and he’s heading home,” said Janssen’s daughter. Marshall, at 9-years-old, is one of the oldest sled dogs on Janssen’s Iditarod team. He is also a family pet, and Janssen’s wife Debbie praises her husband’s quick thinking. ”He loves all these dogs. He told me he couldn’t imagine Marshall dying in front of him,” Debbie told reporters after the incident. 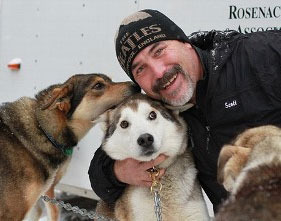 The 2012 Iditarod is Scott Janssen’s second go at the grueling race, which runs the 1,049 miles of dangerous terrain between Anchorage and Nome, Alaska. The race is known both for its historical significance and its more controversial past, which includes allegations of animal cruelty and abuse.